THE WORLD’S RAINFORESTS are often considered the world’s “hot spots” since they are often found in tropical climates and they are home to the majority of the world’s species. As of 2000, studies and surveillance indicated that rainforests may have from one-half to two-thirds of the world’s species, despite only covering 5–7 percent of the world’s surface. Biodiversity is just one of the many advantages that rainforests provide for the planet and that make it worthwhile to protect them. Other contributions from rainforests include carbon sequestration, controlling global warming, preventing soil erosion, minimizing carbon emissions through the photosynthetic process, and preventing DESERTIFICATION. Despite these positive aspects of rainforests, they continue to be threatened by market forces, increased demand for agriculture and a lack of a policy framework in most of the developing countries in which these rainforests are found. Within the tropics, where the temperature lingers at 70 degrees F (20 degrees C) and higher, a rainforest is a common BIOME to encounter. Tropical zones occur primarily within the equatorial zone, 10 degrees within the equator both north and south. 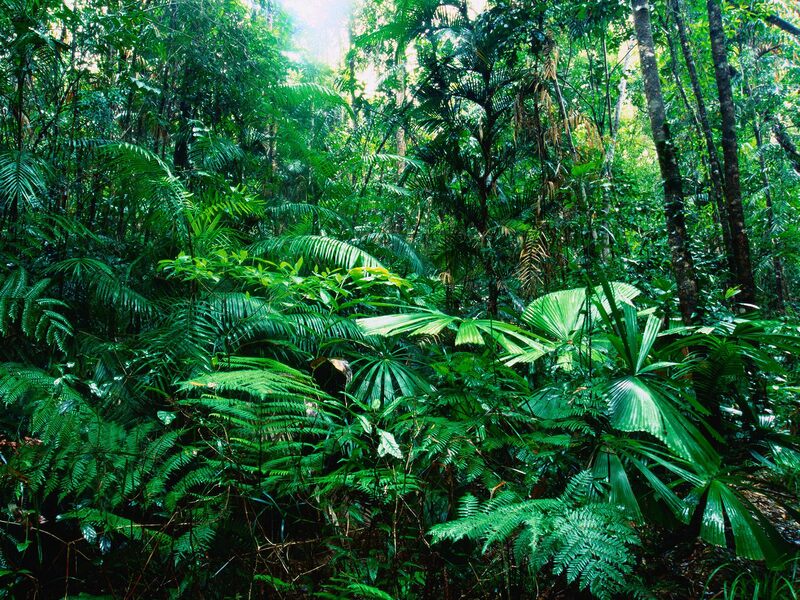 The largest areas of tropical rainforest are in the Amazon Basin of South America and in western Africa and INDONESIA. There are many other smaller areas where rainforests abound throughout Central America and parts of the Pacific. With annual rainfall of over 79 in (200 cm), rainforests are rich with flora and fauna. There may be a dry season that lasts for a month or two, but this is substantially milder than the winter and summer contrast experienced in the temperate zones. Seasonal variation in the rainforests is very slight. The soils found in rainforests are typically old, of decomposed organic matter, and not very fertile to support an abundance of agriculture. Because of the heavy rainfall, leaching of all soluble constituents of the original rock layer occurs, leaving behind a latosol, or a red or yellow soil composed mainly of aluminum and iron oxide. Rainforest soils are not rich in nutrients; the nutrition of the rainforest is lost when logging occurs, since the trees are the main source of nutrients for the ECOSYSTEM. The components of a rainforest are numerous and diverse. The upper layer or “story” consists of trees 147 to 180 ft (45 to 55 m) tall with round or umbrellashaped crowns, and they are referred to as “emergents.” These trees do not necessarily form the canopy characteristic of rainforests; they are tall and small in diameter. The second layer of trees is about 98 to 131 ft (30 to 40 m) tall. The third layer of vegetation rises about 33 to 82 ft (10 to 25 m), and this story contains most of the flowering and fruit produce of plants. The shrub story, or the “understory,” includes dwarf palms, bananalike leaves, and two flora especially characteristic of rainforests: lianas, or vines rooted in soil that climb to the canopy; and epiphytes, plants that grow on other plants. Despite the vast majority of the world’s rainforests being tropical and found in the world’s warmer regions, not all are located in the warm belt of the globe. The world’s oldest forest spans along the western coast of North America, from the panhandle of ALASKA to northern CALIFORNIA. Canopy heights of 197 to 230 ft (60 to 70 m) are usual here, and in the coastal California redwoods, the canopy top regularly reaches 328 ft (100 m). The record height for a redwood is about 367 ft (112 m), the same height as a 28-floor building. The Tongass Forest, located on the panhandle of Alaska as part of this Pacific Northwest spread, is part of the last remaining temperate rainforest in the world. Tongass covers more than 600 mi (965 km) and is home to the largest collection of bald eagles and grizzly bears. The other, the Russian Taiga, located in the western region of RUSSIA, covers more than 2 million miles and could cover the whole of the continental UNITED STATES. Temperate forests are often called evergreen forests and are often considered ancient because of their ancient tree populations. They typically consist of coniferous trees and/or evergreen broadleaf trees. Other typical members include Douglas firs, western hemlocks, and western cedar trees. These temperate forests are unrecognized gems in the Northern Hemisphere that may actually host more species than their tropical counterparts because they possess the oldest and tallest trees in the world, and maintain more plant matter as well. The temperate forests are from where hundreds of substances have been extracted for pharmaceutical use, including the famous taxol, a drug used as an anticancer substance. Tropical or temperate, rainforests are the sources of all kinds of environmental services and commercial commodities to which we are acquainted through the force of our global economy today. Some of the foods that were originally from rainforests around the world include cashew nuts, Brazil nuts, macadamia nuts, bananas, plantains, pineapples, cucumbers, cocoa (chocolate), coffee, tea, avocados, papayas, guavas, mangoes, cassava (a starchy root), tapioca, yams, sweet potatoes, okra, cinnamon, vanilla, nutmeg, mace, ginger, cayenne pepper, cloves, oranges, grapefruit, lemons, limes, passion fruit, peanuts, rice, sugarcane, and coconuts (mostly from coastal areas). In addition to environmental services and commodities, the world’s rainforests are also home to thousands of the world’s indigenous peoples. Many of these groups, like the Yanomamo tribe of the Amazon rainforests of BRAZIL and southern VENEZUELA, have lived in scattered villages in the rainforests for hundreds or thousands of years. These tribes get their food, clothing, and housing mainly from materials they obtain in the forests. Indigenous peoples are mostly hunter-gatherers; they get their food by hunting for meat, fishing for fish, and gathering edible plants like starchy roots and fruit. Many also have small gardens in cleared areas of the forest. Since the soil in the rainforest is rather poor and infertile, the garden areas must be moved after just a few years, and another part of the forest is cleared. The world’s rainforests and their peoples are being threatened by various forces and global needs. Most indigenous populations are declining from diseases like smallpox and measles, which were inadvertently introduced by Europeans, and governmental land seizure, which has monopolized the rainforests, their homes, in ways that are incomprehensible to their ways of life. Depletion is on the rise in southern Asia, INDONESIA, the PHILIPPINES, Central America, and Brazil. Destruction is somewhat slower in other areas including GUYANA, SURINAME, FRENCH GUYANA, the western part of the Brazilian Amazon, and in Africa’s Congo Basin Forest. Illegal logging occurs virtually everywhere, as certain woods, like mahogany, become more scarce. Attempts to slow its extinction are poorly regulated. Precious woods that are supposedly under the protection of a government are by and large unmonitored since it takes resources and transparency to adequately lead a monitoring process and enforce legislation. Many developing countries in which the rainforests are situated simply do not have the funding to maintain proper monitoring of parks and lands classified as reserved. As illegal logging has skyrocketed in the Central and South America, where forests like the Brazilian Amazon, CHILE’s Patagonia, and even forests that have officially been labeled as national parks lie in harm’s way as the global demand for rare, tropical woods increases. Rainforests are also the target of another global market force: agricultural expansion. In the 1990s, demand for beef in the United States, Europe and Latin America greatly increased as fast-food restaurants proliferated all over the world. The multiplication of fastfood restaurant road signs literally spelled out the imminent global change in rising demand of beef. And as demand for beef rises, so does demand for space where cattle can graze. Unfortunately, even though rainforests do not maintain the most fertile of soils and are not equipped to nurture agriculture, cattle grazing is even harder on the land because of the water requirements, the use of monocultural grasses for feed, and lack of enrichment of the soil. Agriculture of crops has evolved and been revolutionized with the proliferation of genetically modified organisms (GMO) and has moved offshore to developing countries as developed countries diminish their agricultural sectors. Soy, a very lucrative crop, has been increasingly farmed and harvested in Brazil, leading to rapid deforestation that occurs at an exponential rate since the crop requires unharvested soil every few years. Moreover, while soy is lucrative as an export for the Brazilian economy, less than 20 percent of the Amazonian soil is suitable for growing it. The problem lies in the global market demand for soy and other crops like it, which may satisfy a consumer demand but impairs a developing country’s economy as well as its natural resources. The solution to sustainable harvesting of the resources of rainforests is to enable the domestic economy that usually depends on its natural resources—often to the extent of endangering species, rapid deforestation, and extensive environmental threat—to profit from conservation. This may occur through developing sustainable tourism. Other reasons why rainforests are being threatened and deforestation is escalating to about a loss of 40 million acres (16 million hecatres) a year, the size of the state of WASHINGTON, is due to the needs of the THIRD WORLD poor. When a country suffers from poverty, environmental degradation does not become a priority, and so unsustainable agricultural practices are extremely common in the parts of the world where the world’s rainforests are often located. Deforestation also creates a new problem of refugees. Thousands of indigenous tribes that have historically lived in the rainforests of the world have been literally run out by deforestation and the expansion of agriculture. Despite the morose picture of the loss of rainforest around the world, the global economy has become porous enough to distinguish a new market for what are called “environmental services,” such as carbon sequestration and preservation of biodiversity. A carbon sequestration program would assign a dollar value to a hectare of forest, essentially assigning a dollar value to the amount of carbon being sequestered in that hectare, and therefore making a hectare of forest more valuable than a hectare of pasture land. The key element in the success of this kind of program is the participation of governments. Because these kinds of relationships usually occur between developed and developing nations, it is imperative that the developing countries play a greater role in negotiations and have the resources to monitor rainforests to ensure their maintenance. There are also reasons for hope because of the public awareness made possible by civil society organizations advocating on behalf of the rainforests and their indigenous communities. In addition, several intergovernmental institutions, such as the European Forest Institute, represent emerging economies and developed countries working jointly to preserve forests that share political boundaries and that provide a variety of services for their citizens. Other institutions serving the same purpose include the World Commission on Forests and Sustainable Development, a massive joint government effort to create awareness of the services provided by rainforests that the world’s population cannot survive without and to formulate sound policy practices that address poverty and trade so that deforestation can be slowed to a sustainable rate. The ways of business and corporate responsibility are also changing, as are the patterns of consumer behavior as consumers become better informed about the status of the world’s rainforests and what remains of them. Companies like Home Depot have been forced to stop selling old growth wood products because their customers do not want to buy products from endangered forests. Scientists are increasingly vocal about the need to protect what remains, politicians are careful not to be branded as antienvironmental, and every year, many countries add new protected areas. Such public actions and efforts have been evident in the last 20 years. Today’s social trends present positive forecasts for protecting the planet’s remaining old-growth forests. However, it remains to be seen whether society will change quickly enough to stop logging companies and others who have a head start in destroying rainforests.